Another easy-to-make recipe from my Hallelujah! Easter cookbook, this is basically scrambled egg with added ingredients. I made it for lunch when just my hubby and I were home one day. Whilst it was simple to make, I wouldn’t have necessarily thought of adding the ingredients suggested, so it was a good recipe to try out. 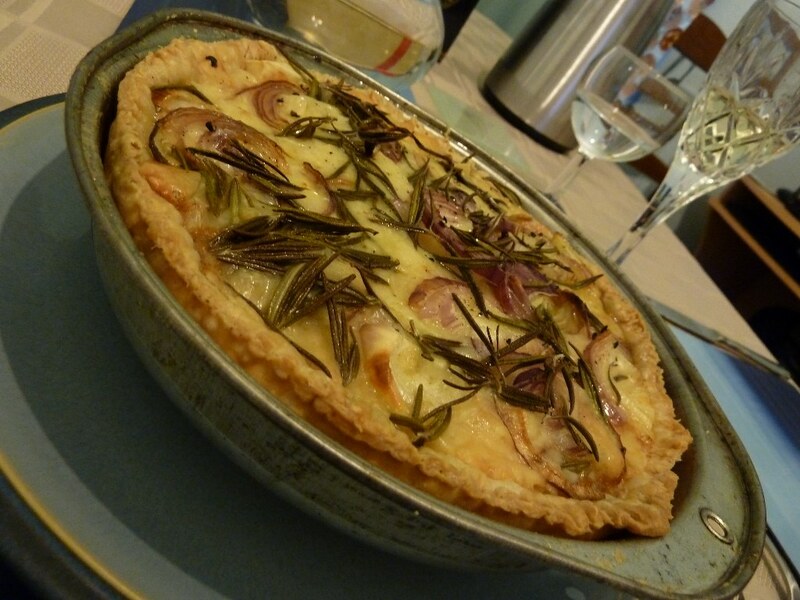 It would also make a good future lunch if you were feeling a bit peckish! The longest, and hardest, part of this recipe is boiling a potato before you start (just one small one between two of you). Of course, if you have one left over from a previous meal this step is much easier! 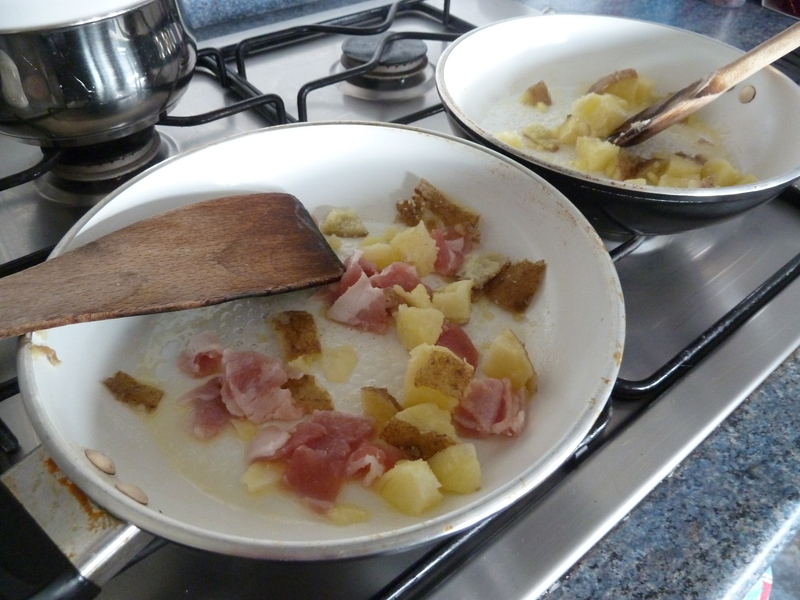 You then fry up the (cut up) potato and some bacon before adding beaten egg, mixed herbs and milk. I actually made two frittatas because Dan doesn’t eat meat and I don’t like tomatoes, so we probably had more food (2 eggs each) than was really intended. 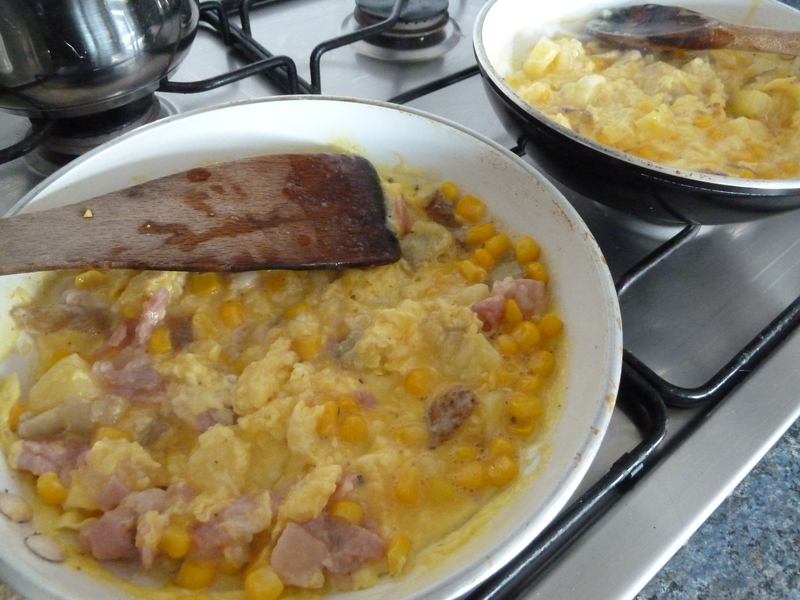 Once the egg is half cooked (which happens quite fast), I added some sweetcorn, tomatoes to Dan’s frittata, and some grated cheese. By the time that was all added and stirred in the eggs were cooked and the meal was ready. Other than boiling the potato, the whole thing took about 10 minutes to put together. Definitely a lunch-time meal I’d make again, and I wouldn’t need to use the recipe to do it. 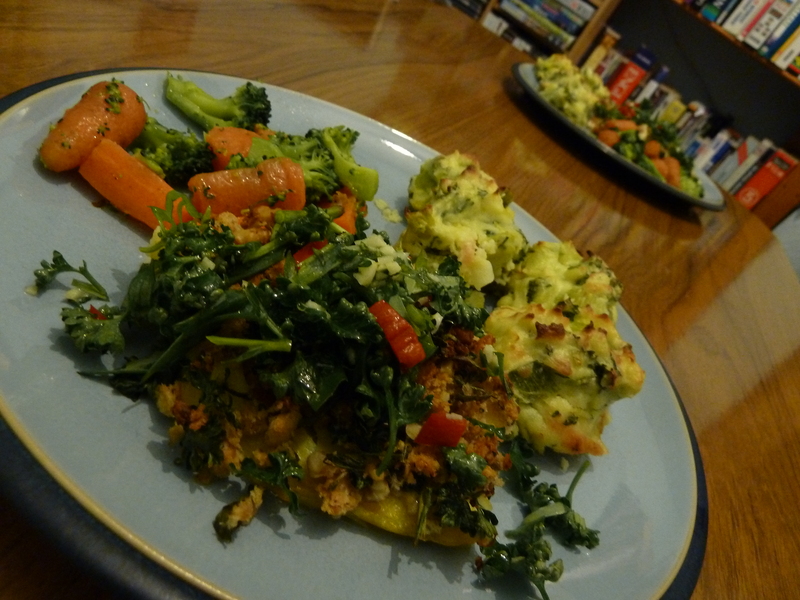 I wouldn’t have thought of adding potatoes and sweetcorn to this, but both were pretty tasty additions. 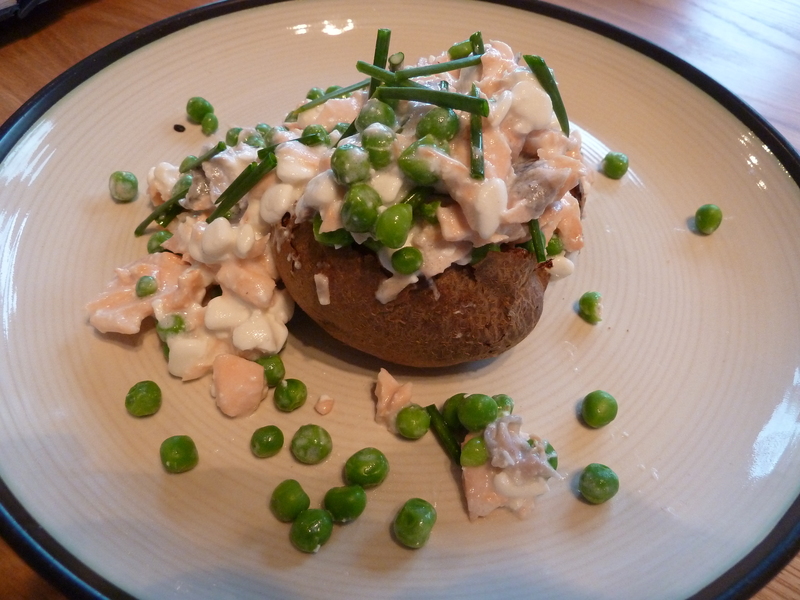 Although if you’re pressed for time I would suggest only adding potato if you already have some cooked. Otherwise just pop it all on a slice of toast! So, here was my next excuse to make tasty food. Dan was going away for the night, so I invited a couple of friends over for dinner. I decided to go with Nigella’s ‘Grown Up Nursery Supper for 6’, because I’ve been looking at the photo of that Prosecco jelly in this cookbook for years now, and every time I see it I really, really want to make (and eat) it. 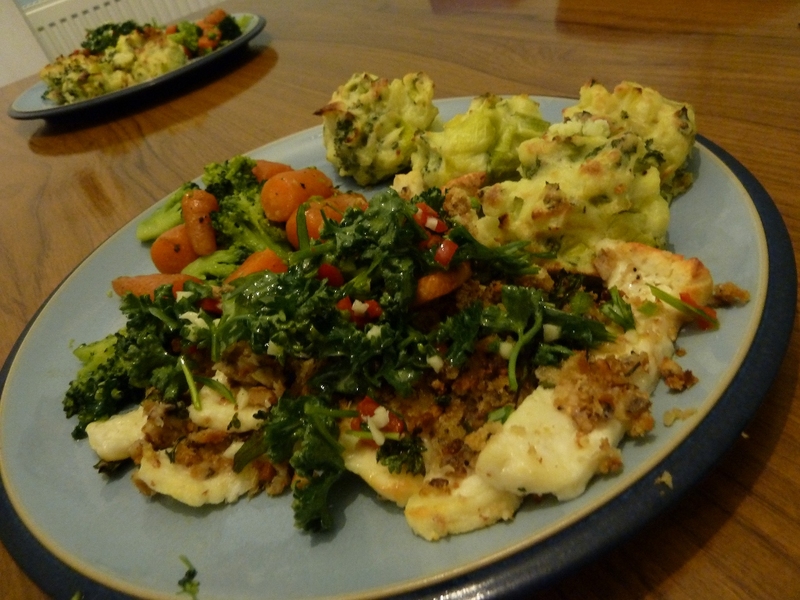 And the main course looked pretty good too. 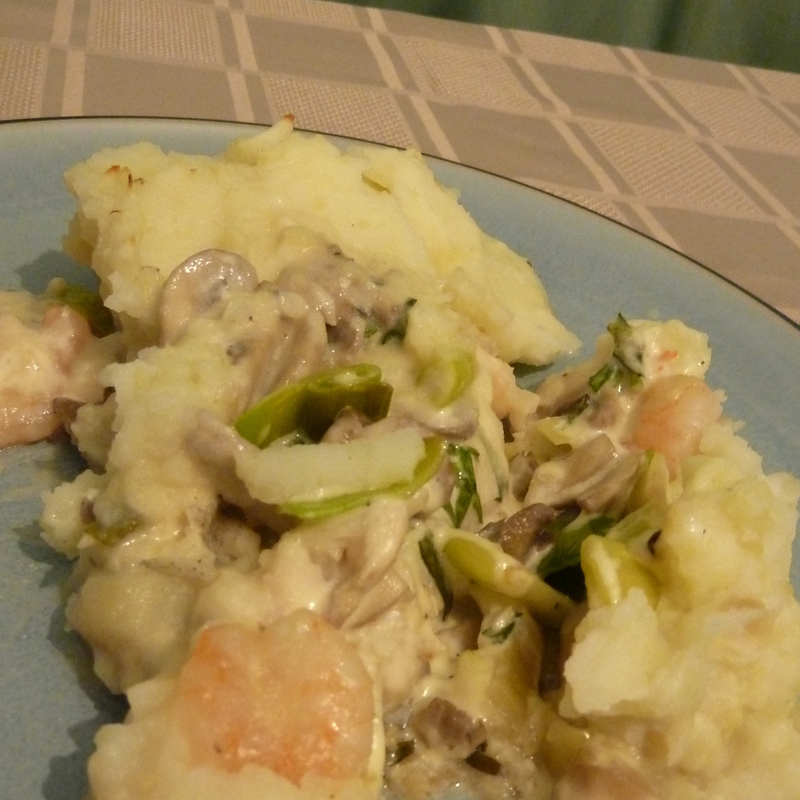 The main course is a fish gratin – basically a white parsley sauce mixed in with fish, and covered with potato. It’s relatively easy to make – especially if (unlike you me) you either know how to skin and bone fish, or buy ready skinned and boned smoked fish. The one thing I will say about a gratin is that you’re not meant to cook the potato. You slice it very thinly, put it on top of the dish and cook it in the oven for an hour or so. We’ve made this mistake before, and ended up with uncooked potato. So, this time around, I sliced the potato but then parboiled them, just for 5-10 minutes, before putting the dish in the oven. I’m pleased to say it all worked really well. My only slight complaint is that it didn’t seem like that much food. This was meant to be a meal for 6, so I halved the amounts as there were 3 of us. I could have done with just taking a third off. A bit of a shame, because the amounts in Nigella’s recipes are usually pretty good estimates. Let us bow our head for the pies. It is with great regret that I inform you of the tragic passing of one of the most interesting and yet mistreated members of this gastronomic experiment: the pie. Sadly, no records have remained of this valiant stalwart of the oven. It shall be remembered for its chestnuts, naturally; but also its mushrooms; and pastry was here aplenty. But there is no photograph to recall the salivation that passed my lips as I bit into its tender and delicate body. Served with cheesy potato cakes it was a rather pleasing, though subtle main meal. Next time I would probably increase the amount of herbs, yet I would certainly hope there was a next time. Who made it: Dan did most of the pie making, with Anna doing the potatoes and helping with many of the flaky pastry details. Recipe: “The complete Vegetarian Cookbook”, page 257.